Nyquist holds off the late charge of Exaggerator to win the 142nd Kentucky Derby. Paul and Zillah Reddam’s Nyquist was a bit of an unusual favorite going into Saturday’s $2.391 million Kentucky Derby (GI) in that either people believed, or they didn’t — with very few in between. He had more question marks surrounding him than The Riddler in a Batman movie. We all knew the challenges he faced: in addition to the age-old “can he get the distance” speculation, Nyquist was attempting to become the first Breeders’ Cup Juvenile (GI) winner to capture the Derby since Street Sense in 2007 and the first undefeated champion to win the Derby since Seattle Slew in 1977. He was also the richest runner in history to have contested the Derby, took an unusual path to make the gate under the Twin Spires and drew a less-than-favorable post position for his front-running style. But if anyone in Nyquist’s camp felt the pressure, it was hard to tell. In front of a crowd of more than 160,000 cheering people and under regular jockey Mario Gutierrez, the Doug O’Neill-trained Nyquist broke smartly from post position 13, made his way to the front easily before the field crossed under the finish line the first time, allowed rival Danzing Candy to assume the lead and set all the pace with a clear lead in rapid splits of :22.58, :45.72 and 1:10.40 while stalking right behind and to the outside of Gun Runner with Outwork chasing in hot pursuit. The positions of those four didn’t change much until the far turn, when Nyquist briefly let Gun Runner take the lead as Danzing Candy began to tire. After Gun Runner past the quarter pole in 1:35.61, Nyquist was in full stride to the outside. Though Gun Runner held on gamely down the lane, he was no match for Nyquist, who inched away with every stride to the wire, stopping the clock in a respectable 2:01.31 over a track rated fast despite the rains that peppered Churchill Downs on and off all afternoon. Exaggerator closed from way near the back of the back in the early going and finished better than all but one, crossing the wire 1 1/4 lengths behind Nyquist. Gun Runner was game to hang on to third, and was followed by Mohaymen, Suddenbreakingnews, Destin, Brody’s Cause, Mo Tom, Lani, Mor Spirit, My Man Sam, Tom’s Ready, Creator, Outwork, Danzing Candy, Trojan Nation, Oscar Nominated, Majesto and Whitmore. Shagaf did not finish, but walked off the track under his own power and was reported to be fine, but tired. As the public’s 2-1 favorite, Nyquist returned $6.60, $4.80 and $3.60. Second choice Exaggerator, at 5-1, capped off the $30.60 exacta and paid $5.40 and $4.20, while Gun Runner was good for $6 as the 10-1 third choice. The trifecta paid $173.40 and the superfecta with near 12-1 shot Mohaymen was worth $542.10. The team of Reddam, O’Neill and Gutierrez had worn the roses before after I’ll Have Another’s victory in 2012, but returning to win again put the icing on the cake for the popular team. “It’s unbelievable,” O’Neill said. “Got to thank Paul and Zillah for this opportunity. Like Paul said, he knows the O’Neill language. I know the Elias language, his groom. 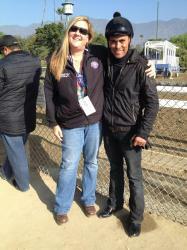 And the Johnny Garcia language, his exercise rider. And those guys, they are the unsung heroes. Because they do all the work, and they are there long hours. And I could tell in the last week or so, Elias he is very serious about his trade and loves his horses so much. He has been smiling more than I have ever seen him smile. I didn’t know what was going on. Now I think we all know. “I think we would all be lying if we got beat here today, we would say maybe we didn’t do enough with him. Maybe that was the only worry. Other than that, he’s just a remarkable athlete that, if you work him by himself, he will even swish his tail a little bit like what do you want? What do you want for me? You put him in company, and he’s just a Ferrari,” O’Neill concluded. The veteran trainer also gave tremendous credit to Gutierrez, who remained completely cool under pressure and delivered a perfectly timed ride. 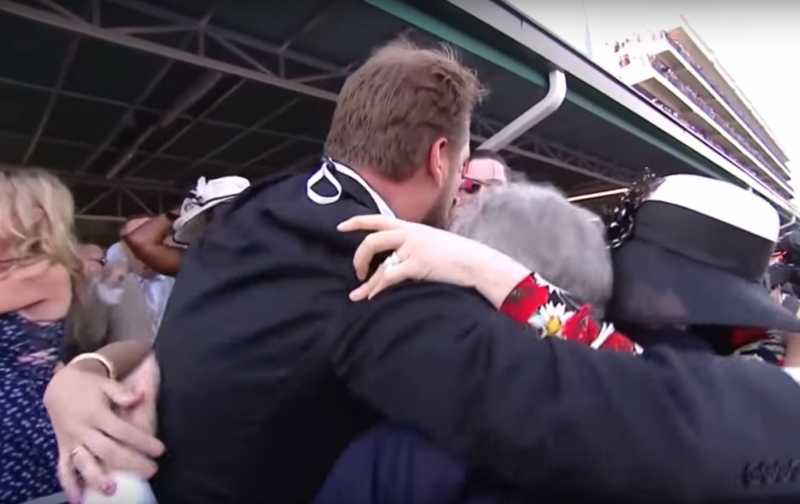 Nyquist’s connections celebrate in the stands at Churchill Downs. Nyquist, who is named for the Detroit Red Wings player Gustav Nyquist, earned $1,631,600 for his Derby win to bring his career earnings to $4,954,200 and he stands undefeated in eight starts. In addition to the Breeders’ Cup Juvenile, he also won the Del Mar Futurity (GI), Frontrunner Stakes (GI), San Vicente Stakes (GII) and Florida Derby (GI). It was a near-record day for Churchill Downs following last year’s Triple Crown Run from American Pharoah. Attendance of 167,227 was the second-largest crowd in Derby history, just under the record of 170,513 in 2015. All-source wagering on the Kentucky Derby Day card was also the second-highest in history, totaling $192.6 million and just one percent off the record set in 2015. Wagering from all-sources on the Kentucky Derby itself was $124.7 million, down 10 percent from 2015’s record. On-track wagering on the Kentucky Derby Day program was up two percent to $23.5 million, just shy of the record $23.7 million in 2012. On-track wagering on the Kentucky Derby race totaled $11.3 million, a decrease of six percent from 2015. Nyquist will next contest the May 21 Preakness Stakes (GI) where he’ll likely have a rematch with Exaggerator and potentially a host of new shooters, including Cherry Wine, Laoban, Awesome Speed, Collected, Stradivari, and Uncle Lino. O’Neill indicated Nyqvist will head to Baltimore to prep for the Preakness on Monday.